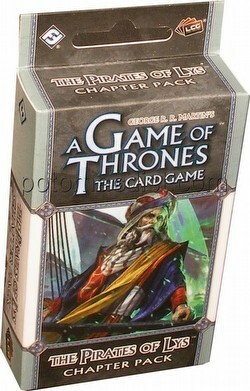 The Pirates of Lys is the third Chapter Pack from the A Song of the Sea cycle for A Game of Thrones: The Card Game. As the tides carry the Great Houses and their fleets further out to sea, the A Song of the Sea cycle continues to give shape to each House's naval presence with the sixty new cards (three copies each of twenty individual cards) from The Pirates of Lys. The naval challenge enhancement continues to feature prominently, and players will find deep synergies between the Chapter Pack's characters, events, and locations. Several cards reward players for winning challenges by four or more total strength. A new agenda encourages radical new deck designs. The Greyjoys and Lannisters cook up new schemes, and House Baratheon looks to hatch intrigues and win power with its burgeoning fleet of Smugglers.